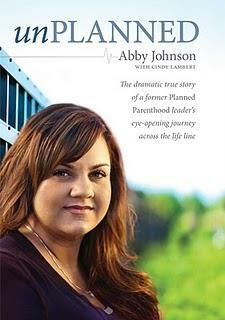 Abby Johnson, the former Planned Parenthood leader who is now a highly visible pro-life advocate, has written her story, Unplanned, currently available from Tyndale House Publishers and Focus on the Family. Johnson’s book, written with Cindy Lambert, is the dramatic true account of Johnson’s decision to cross to the other side in the abortion debate. Johnson’s decision to leave her job after eight years with Planned Parenthood, originally as a volunteer and then as an employee, came after she participated in an ultrasound-assisted abortion procedure for the first time. Her action became national news when Planned Parenthood took her to court in the fall of 2009. Unplanned reveals what Johnson initially found so attractive about the mission of Planned Parenthood, the personal secret she never divulged, and the disturbing events that caused her to suddenly quit her job. Unplanned: The Dramatic True Story of a Former Planned Parenthood Leader’s Eye-Opening Journey across the Life Line offers an insider’s viewpoint on Planned Parenthood’s practices, as well as on the heartfelt but misguided efforts of some radical anti-abortion activists. I found it so frightening and heartbreaking to read that an abortion takes place every 24 seconds and that over 3,600 abortions occur every day in the United States. I am still reading this book, and I find it a subject that is very hard to comment about. I believe it's a woman's right if she wants to abort... no one has a right to judge her decision. wow. i am going to check this book out for sure! just saying hi from mailbox monday. i'm a longtime email subscriber! i just stumbled upon your blog bc your title is HILARIOUS! please don't ever change it. Just a quick reminder to head over and link up to my Welcome Wednesday hop! The linky is now open. Hope you ended up with some new followers last week!